2016 might be the biggest year to date for comic book themed movies, with Deadpool, Batman v Superman: Dawn of Justice, Captain America: Civil War, X-Men: Apocalypse, Suicide Squad, Gambit, Doctor Strange, as well as the latest Star Wars film, Rogue One. Which means that every major Marvel and DC character will come to life in cinemas across the world. And SuperHeroStuff is celebrating! Not only are they your essential destination for super-hero clothing and swag, but they’re also acknowledging the year of the hero with two major events, a sale and a giveaway! First up is the sale which gives you 10% off on the included franchises and characters simply by entering the code MOVIES10. 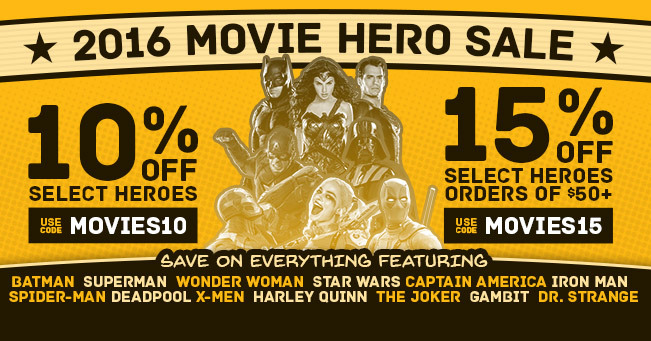 Spend $50 or more and that discount increases to 15% off by entering the code MOVIES15. Be sure to check out their Batman V Superman merchandise available now! Second is the contest, which features a grand prize worth salivating over. It includes a $250 Fandango gift card to see all of the comic book movies this year as well as a $200 SuperHeroStuff shopping spree. Second prize is a $50 shopping spree and 10 runner ups will receive a free t-shirt! So, the only question to ask is, what are you waiting for?